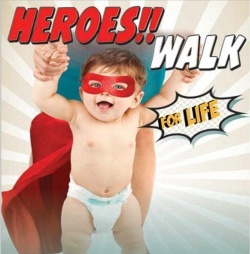 Local residents are invited to dress up as their favorite superheroes and join Sacramento Life Center’s Heroes Walk for Life on May 14 at Maidu Park in Roseville from 8:30 a.m.-12:30 p.m. The 2K and 5K walk and fun run will raise funds for free pregnancy services at the Sacramento Life Center, benefiting low-income pregnant women and teens. The family-friendly event will include a rally, toddler dash, costume contest, bounce houses, a carnival and more. Registration is $25, but free for kids ages 12 and under. For more information, to sign up or to make a donation, visit www.saclife.org or www.walkingheroes.org.